For Christmas, For The Ascension, For Whitsuntide. Words and Original Music: Unknown. Source: Emily Ayckbowm, ed., Hymns for the children of the church: with accompanying tunes. First Edition. (London: Church Extension Association, 1907), No. 98, p. 124. The Apostles knelt to pray. And Mary, mother of our LORD. And knew hat God was there. Told them the Comforter was given. And rested there in sight. Which drew men's hearts unto the Lord. And never leave us till the end. Amen. 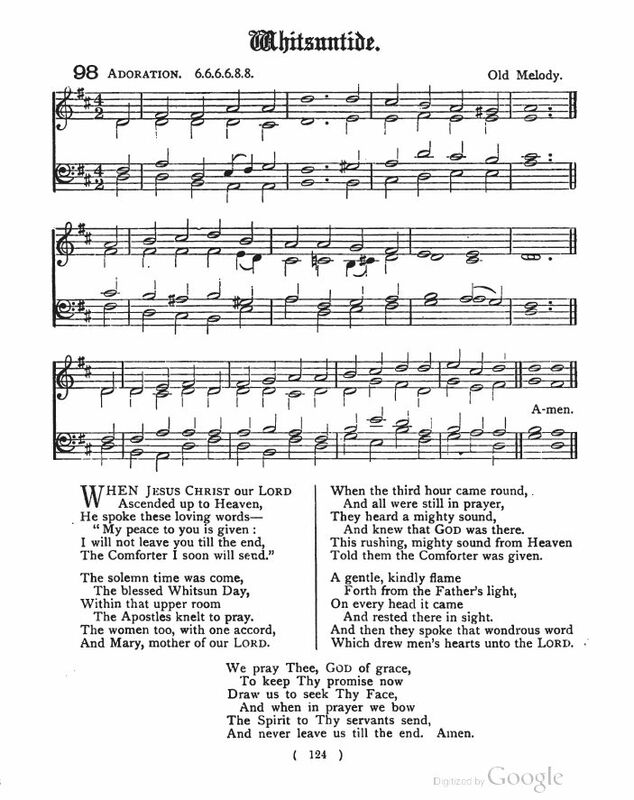 Sheet music from Emily Ayckbowm, ed., Hymns for the children of the church: with accompanying tunes. First Edition. (London: Church Extension Association, 1907), No. 98, p. 124. As we have seen elsewhere, it was not uncommon to see songs sung at Christmas that have little to do with the Nativity. In earlier centuries, the faithful sang songs that celebrated various episodes in the life of Christ, as well as his Birth.